The oil terminal that has been proposed in Vancouver, on the Washington side of the Columbia River, would be the largest oil-by-rail operation on the West Coast. The terminal plans to ship out 380,000 crude oil barrels-per-day which would travel to Vancouver by rail from the Bakken oil shale fields in North Dakota (Portland Rising Tide) (See Shale Oil; Bakken Oil Shale Basin). The oil terminal would ship crude oil to refineries in California, Washington, Alaska, and Hawaii. Additionally, with the development of domestic crude oil now allowed to be exported, the Vancouver oil terminal would most likely be servicing foreign markets as well (Sahu). The type of crude oil that would be transported to and from the Vancouver oil terminal is highly volatile. A minimum of four unit trains, each 1 ½-mile long, would have to travel to the proposed oil terminal per day in order to ship out an average of 360,000 barrels of oil (Columbia Riverkeeper). Oil routes to West Coast refineries are currently only overland, which means that the oil is being transferred from the oil production facility to rail and then rail to refinery. The proposed plan would instead have the oil traveling from oil production facility to rail, rail to terminal, terminal to ship, and then ship to refinery. Each transfer point “increases the potential for human error and mechanical failure, and increases spill risk” (Harvey). The risks of an oil train explosion occurring in a populated area are so high that some locals are opposing the Vancouver oil terminal on that point alone. The local fire departments are not equipped to handle such a catastrophic emergency (See Health Workers & First Responders). In its Draft Environmental Impact Statement, the Energy Facility Site Evaluation Council did not state what kinds of trainings or equipment would be necessary to fully prepare local fire departments (Attorney General’s Office). The fact is that Tesoro-Savage cannot guarantee with absolute certainty that a train derailment will not occur, no matter what the company claims (See Oil Train Explosions). The International Longshore and Warehouse Union has opposed multiple oil terminals in Vancouver, and continues to oppose this most recent Tesoro-Savage terminal, specifically because of the overwhelming amount of risks involved in running such a facility (See Labor Unions). A June 2016 Bakken oil train fire in the Columbia Gorge at Mosier, Oregon, realized the worse fears of oil terminal opponents and other residents (Templeton). “The Columbia River has the largest salmon run in the lower 48. If we lose that, we lose the entire fishing economy, we lose our recreation economy. It’s not always a matter of adding more jobs when these oil terminals come in, it’s often a matter of taking away existing jobs” (Vice News). In the event of an oil spill, the DEIS does not address the necessary resources to clean up, or even prevent, an oil spill. Instead, it simply calls for more research to be done on the subject of oil spill recovery and prevention. The Columbia River Inter-Tribal Fish Commission, or CRITFC, has taken its own stand against the Tesoro-Savage oil terminal. The CRITFC has begun the argument that the Vancouver oil terminal imposes on the tribes’ treaty fishing rights due to the inherent danger of train derailments, explosions, and oil spills to the fishing region and the neighboring tribal communities (CRITFC). Cathy Sampson-Kruse, an elder of the Wallulapum band under the Confederated Tribes of the Umatilla, said that “‘the [Draft Environmental Impact Statement] fails to understand what true tribal sovereignty means’” (Johnson). The Director of Natural Resources for the Umatilla Tribes, Eric Quaempts, backs up Sampson-Kruse’s statement with his claim that “The terminal will potentially impact fishing sites and the fish themselves… and tribal fishing rights don’t mean anything without healthy fish in the rivers” (Plaven). The Port of Vancouver approved Tesoro-Savage’s lease for Terminal 5 in 2013. The Energy Facility Site Evaluation Council, or EFSEC, provided a Draft Environmental Impact Statement on Nov. 24, 2015 which will be finalized by the state evaluation council. Washington Governor Jay Inslee has the final say on the construction of the Vancouver oil terminal (Corvin). In July 2016, the Vancouver City Council voted unanimously to oppose the oil terminal (Dake). Attorney General’s Office. (2016, January 22) AG questions derailment data, emergency plan for Vancouver oil. Washington State Office of the Attorney General. Columbia Riverkeeper. (2016, January). Fact sheet: Overview of the Tesoro Savage Oil Terminal draft EIS. Columbia Riverkeeper. Columbia Riverkeeper. (n. d.). Oil-By-Rail. Columbia Riverkeeper. Corvin, A. (2015, August 17). Small business coalition says oil terminal will cost jobs. The Columbian. CRITFC. (n. d.). Tribes petition to intervene in Vancouver’s Tesoro-Savage oil terminal debate. Columbia River Inter-Tribal Fish Commission. Harvey Consulting, LLC. (2016, January 18). Vancouver Energy Distribution Terminal Facility, DEIS. Columbia Riverkeeper. Johnson, B. (2015, December 1). Opponents lay out issues with Vancouver oil terminal. The Columbian. Plaven, George. (2015, December 1). Oil terminal opponents say trains could come through Pendleton. East Oregonian. Portland Rising Tide. (n. d.). Vancouver, WA Oil Terminal. Portland Rising Tide. Sahu, R. (2016, January 2016). Tesoro Savage Vancouver Energy Project: Review of draft EIS preliminary report – air quality. Columbia Riverkeeper. Vice News. (2014, July 29). 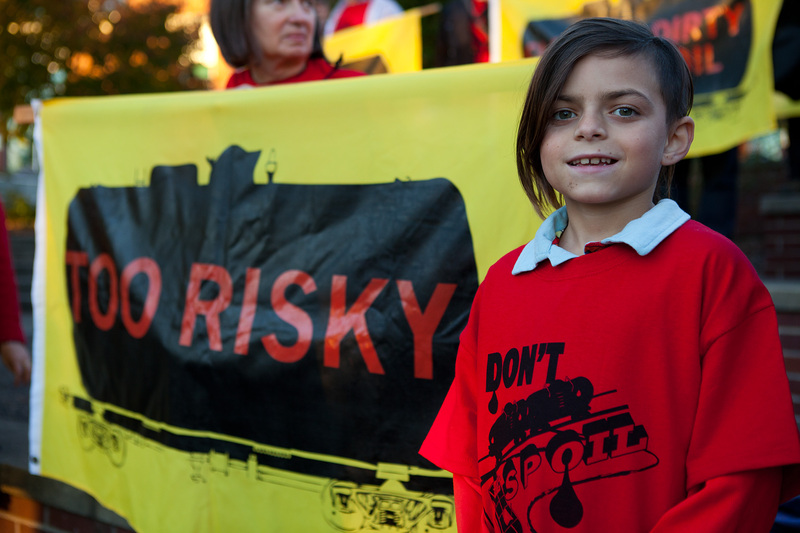 Bomb trains: The crude gamble of oil by rail. Vice News.